This Zen Dreams Sunset Pure Silk Chiffon Scarf contains dreamy hues inspired by the ethereal presence of one's spirit evoked by meditative contemplation and photography of air coming through clouds. This fashion scarf is the perfect accessory. Wear it as a stunning evening wrap for that special occasion or all day for a unique burst of color in any ensemble. 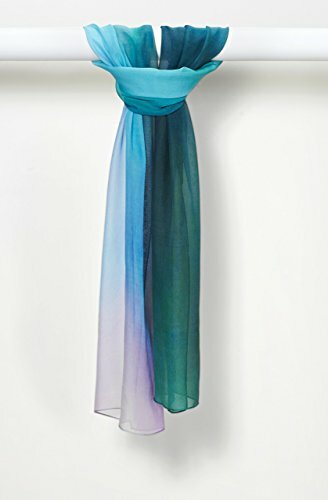 Each painterly scarf measures 17″ x 72″ in organic smooth silk chiffon. Variation in printing & color are hallmarks of digital printing with natural fiber-reactive dyes. Due to the nature of the materials, no two pieces will be exactly alike.